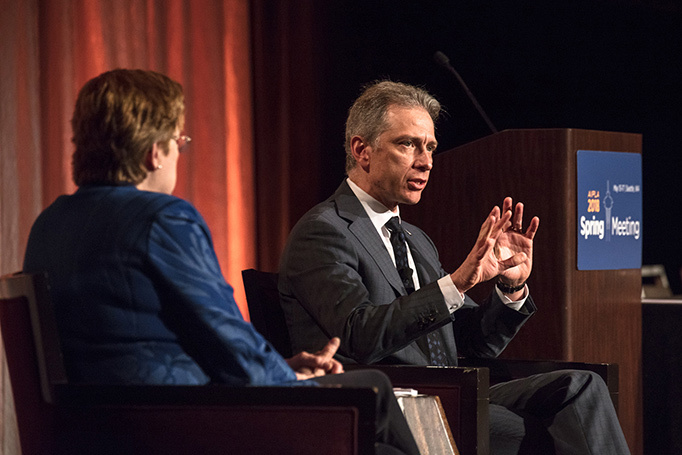 USPTO Director Andrei Iancu joins AIPLA Executive Director Lisa Jorgenson to talk IP and the U.S. patent system at AIPLA's 2018 Spring Meeting in Seattle, Washington. I recently joined several of the USPTO’s intellectual property (IP) attachés and the regional director of the USPTO’s Silicon Valley office, John Cabeca, in Seattle. We were there to meet with IP stakeholders, visit several leading companies in the region, and attend a series of meetings, including the American Intellectual Property Law Association’s 2018 Spring Meeting. Certainly a highlight of our time in Seattle was the opportunity to tour the facilities of several Washington-based companies that have an acute awareness of the growing importance of protecting and enforcing their IP, both at home and abroad. One of them was Seattle Genetics, a biotech company based in Bothell, Washington. Founded in 1997, the company has grown to be among the 25 largest U.S. biotech companies by market capitalization, with nearly a thousand employees. Currently, Seattle Genetics holds more than 80 patents. During our meeting and subsequent lab tour, representatives of Seattle Genetics explained to us their goal of transforming cancer therapy with multiple, globally available products, and they detailed the company’s significant research into advancing its antibody drug conjugate technology, a proprietary process that links the specificity of monoclonal antibodies with potent cell-killing agents to treat cancer. Intellectual property is critically important to enabling companies like Seattle Genetics to develop life-saving and world-changing products. The biotech industry is one of the most innovative and fastest growing sectors in the U.S. economy: according to a 2016 report from the Biotechnology Innovation Organization, it accounted for more than 1.6 million employees across some 77,000 business establishments in 2014, offering significantly above-average wages. 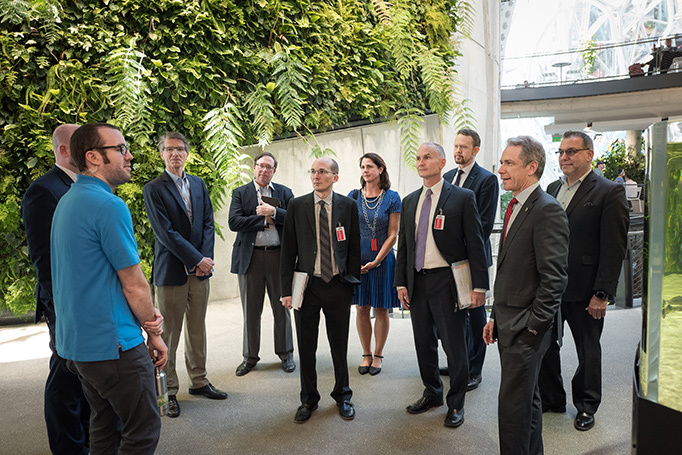 Following a tour of Amazon HQ with USPTO Director Andrei Iancu, the IP Attachés met with Amazon's IP team to discuss concerns with counterfeiting and piracy around the world. The biotech industry faces some unique challenges in protecting its IP abroad. That is where the USPTO’s IP attachés—who are U.S. diplomats posted in 12 locations throughout the world—are an invaluable resource. They help ensure that foreign laws, regulations, and IP enforcement regimes in their respective regions effectively protect the IP of U.S. biotech firms such as Seattle Genetics. They also work with foreign officials to improve patent and trademark practices, offer guidance to police and customs officials on enforcement mechanisms, as well as monitor the activities of international and regional organizations that might affect the IP interests of U.S. companies. USPTO’s IP attachés are a valued resource to U.S. companies and their representatives when they contemplate entering or expanding in these overseas markets. My visit to Seattle Genetics further impressed upon me the importance of the USPTO’s IP attachés’ work on behalf of U.S. interests, particularly those of our most cutting-edge, jobs-producing industries. Our subsequent visits with several other Seattle-area companies—including Amazon and Nintendo of America—underlined how important a job we have, no matter the industry, in protecting U.S. IP overseas. Learn more about the USPTO’s IP Attaché Program.